Based in Perth but loved all over the world, SLUMBERJACK, dubbed the kings of melodic, vocal-driven trap, captivate audiences with their unparalleled emotive tracks. After making waves in the Australian bass scene in 2014, the boys have found a solid home with Diplo’s legendary Mad Decent. 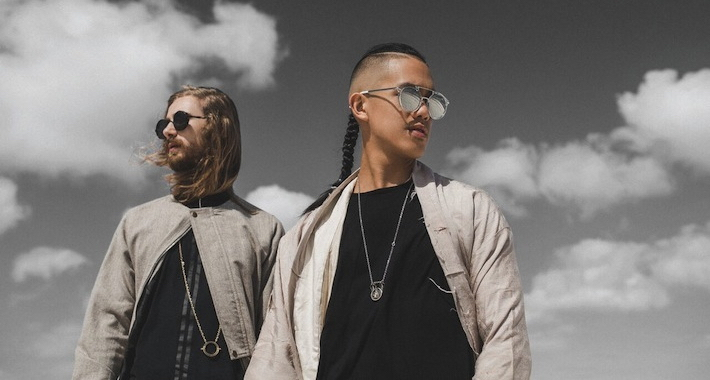 Blurring the lines between trap and what might be considered material heard at EDCLV’s kineticFIELD, SLUMBERJACK have managed to fuse elements from all forms of dance music into their latest EP, Fracture. The duo has expertly crafted four memorable tracks along with a short interlude­, with each track featuring almost exclusively Australian singers and songwriters. “Fracture” leads the journey with vibe-drenched vocals from Vera Blue. It’s the perfect trap-crossover tune, along with “Take Me,” a track featuring KLP. Anthem track “Afraid, Unafraid” illuminates with an infectious carefree melody paired with SLUMBERJACK’s untouchable sound design and Sydnee Carter’s breathtaking vocals. Carving out some between gigs, SLUMBERJACK sat with Team Bassrush for a quick chat about the diverse musical palettes behind Fracture, and insight about the ever-growing bass scene down in Australia and New Zealand. Tell us about your relationship with Mad Decent. How do you feel they’ve nurtured your sound now that the second EP has been released? It’s been really great working with Mad Decent on this project because they’ve given us a lot of autonomy to develop the sound in the direction we wanted to. We had some really great discussions with the guys over at the label on which of the demos they were digging and we’re glad to find that they were into the ones that we felt really passionately about. The musicality in the interlude “Cradle to The Grave” and “Paralyse” is phenomenal. You guys seem really comfortable bringing natural elements into your productions. How do you find a balance and let the instrument breathe within the arrangement? What we’ve found over the years working on music is that less can be more. With two producers in the studio, we often end up with a track rammed full of too many ideas and as heartbreaking as it is, have to go through and cut out a lot of content. When we’re using really special instruments, such as the Indian Sarangi in “Cradle To Grave,” it’s all about having just the right number of supporting elements without taking the attention away. “Afraid, Unafraid” is such an alluring track; tell us about linking up with Sydnee Carter. We actually met up with Sydnee for the first time in Singapore and realised we were both from the same city in Australia (Perth). It was at an Aussie BBQ, a showcase of Australian acts at the Music Matters conference where we were watched her acoustically perform (very impressively at that) some of the songs she’d written. It’s funny how different tracks come together, because some can take over a year, but with “Afraid, Unafraid,” we literally sent Sydnee the demo and were like, “Hey, can you come and record this tomorrow?” I guess putting the pressure on worked because she came in the following day with the amazing vocal line you hear on the final version. We don’t see anyone credited on “Paralyse.” Where did that dreamy female vocal originate? The vocal on Paralyse came from Alex, lead singer of Ember Island. We first heard her cover of Porter Robinson’s “Sad Machine” and knew we needed to work with them. There’s something about her tone that sends shivers down our spine every time. We can’t help but notice that bass music seems to be flourishing in your part of the world. Tell us about the Fracture Tour and where you’re heading. It’s true, Australians love their bass, but at the same time everyone is still very open to experiencing other styles. The Fracture Tour is something that we envisioned since the very start of SLUMBERJACK but it wasn’t until now that we have the team and experience to pull it off. We’re hitting all the Australian capital cities as well as a couple of cities in New Zealand, and the idea is to deliver a show about more than just the music. We actually developed our own visual show, and worked closely with an amazingly talented lighting team to bring in some great production. And of course, we’ll be playing all our own music, a lot of which has been remixed and turned into VIP versions for the show. Hopefully it’s something we’ll be able to bring to the Europe and North America in the near future.